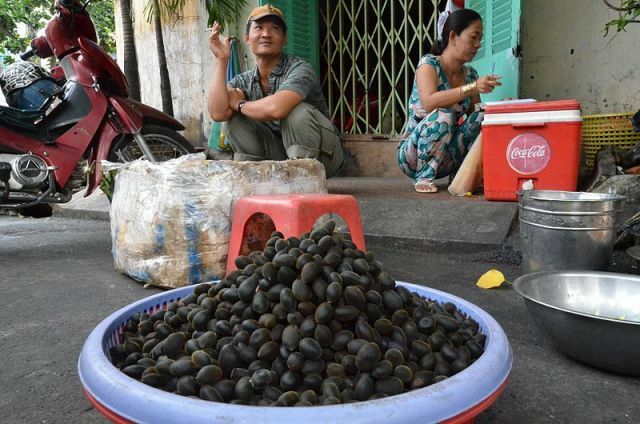 Chinese Olive is native to the subtropics of Asia. It is different from European olive which is basically for oil. In case of Chinese olive, it is the dried fruits and the nuts which are consumed. Chinese olive trees are planted in Vietnam, Japan, Malaysia, etc besides China.. The native habitat is in 22°N-26°N. An annual average temperature of 20-22° C is needed, with a rainfall of 1200-1400 mm. It is cold sensitive and does not withstand sub-zero temperature. 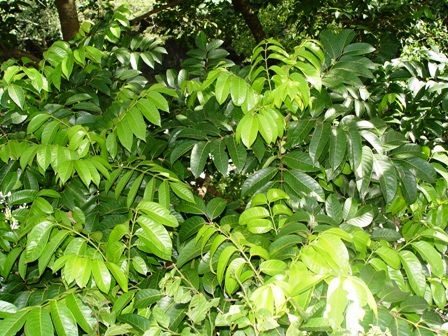 Tree, 10-18 m high, trunk and branch with aromatic resin, odd-pinnate compound leaf, alternate; leaflet with petiolule, opposite, entire, papyraceous to coriaceous; slightly concave reticulate veins giving a special smell while twisted; floret unisexual or polygamous; staminate inflorescence thyrsoid, pistillate inflorescence racemose, inflorescences terminal or axillary, corolla white to yellowish white. Fruit an elliptic to ovate drupe; epicarp thick, yellowish green when mature; putament hard, two ends pointed, trachyspermous; seeds 1-2. Flowering takes place in April to May. The fruits mature from October to December. 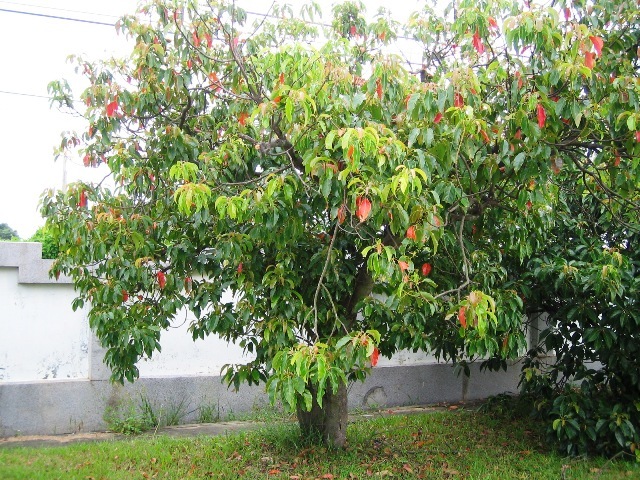 The tree is planted in China along the highways, streets and in gardens. The fresh fruit is crisp, first tastes a little bitter, and then tastes fragrant, sour, and sweet after chewed for a longer time. It is used in stir-fry dishes and loved with chicken. It is one of the two most common items used in the making of crack seed. It is also used in varieties of preserved fruits and beverages. Dried fruits and seeds are also edible and are eaten in China. Wood is used for timber, ship building and for making furniture. In China, the fruit, nut, seed, and root have been used as medicines for a long time. Traditional Chinese Medicines (TCM) regards that Chinese Olive fruit remove heat from the lung, relieve sore throats, promote the production of body fluid and detoxicating, and is used for swollen and sore throat, excessive thirst, hematemesis due to cough, lacillary dysentery, epilepsy, puffer poisoning, alcoholism, etc. Fruit smaller, oval to oblong, each about 8 gram weight; peak pointed rounded, base rounded; pericarp deep green, glabrous; sarcocarp sallow, crisp, fibre less, tartness less, smell fragrant, aftertaste sweet and refreshing. It is one of the best cultivars for fresh edibility. Produced in Minqing, Minhou, Fujian Province. Inflorescence starts in April, buds open in May, flowering lasts for about 35 days. The fruit matures in November.hepato-protection, etc. Fruit bigger, ovoid, each about 20 gram weight; peak rounded, base retuse; pericarp green, glabrous; sarcocarp thick, light white, soft and tender, fibre little, tarter, fragrance thin. It is one of the best cultivars for processing. Produced in Minqing, Minhou, Fujian Province. Inflorescence starts and buds open in May, flowering lasts for about 24 days, fruit matures in November. The size of fruit varies, each of 6-16 gram weight, shape longer, the total length of 7Changying fruits, of one strain, is 30-33 cm; pointed at two ends; sarcocarp with texture, tartness a little. It is the most used for processing. Produced in Minqing and Minhou, Fujian Province. Fruit matures in November. Fruit smaller, slight, shape rhombic, each 7 gram weight; peak acute, base muticous,pericarp wax yellow; sarcocarp yellow, with texture, tartness a little, smell fragrant, aftertaste sweet. It can be used for eating fresh or processing. Produced in Putian, Fujian Province. Fruit matures in October -November. Fruit slight, and retuse in the middle, looks like kidney of pig (Zhuyao); pericarp deepgreen with ebony macula; sarcocarp fine, crisp and sweet. Mature fruit doesn’t easily drop off. It is one of the best cultivars in Guangzhou for eating fresh. Fruit shorter; pericarp deep green with ebony macula; sarcocarp fine, tartness little, aftertaste sweet. Its yield is higher. It is one of the best cultivars in Guangzhou for eating fresh. Fruit oblong, pericarp greyish black with ebony black macula of stylar relic, base with 4 furrows, peak round, red; single fruit about 11 gram; sarcocarp sweet and fragrant, fibre less. Matures in the first ten days of August. Common in the suburbs of Guangzhou. Fruit oblong, pericarp greyish black with ebony macula of stylar relic, base reddish yellow; sarcocarp thick, sweet, crisp, and fragrant. Matures in October. Distributed in Zengxian, Guangdong province. In fact, the cultivars of Chinese Olive are much more extensive than the above. Chinese Olive has a rich cultivar resource. Since it reproduces from seed, its variance is large and brings about many local cultivars after natural selection and manual cultivation for long time, some suitable as fresh fruit, some for processing, some only as rootstock for propagation. The date of fruit collection varies with different purpose for fresh eating, for processing or medicinal use. Harvesting starts from August, for fresh fruit in October-December till the frost comes once or two times. The later the fruit is picked, the stronger the flavour is, and the better the fruit is judges. However, the outcome is that the yield decreases markedly in the next year, for shoots bearing fruits can’t germinate in the autumn. The fruit is picked manually, or collected by shaking branches to drop after spraying 300 ppm ethylene solution at 3-4 days. After storage, the fruit tastes better, feels crisper, and smells pleasant; the content of organic acids and chlorophyll decrease, o of carotenoid increases. In the past, farmers usually stored a little in gallipot for 4-5 months, in cannikin or bamboo basket for 2- 3 months. Now it is stored in a plastic bags for 4-5 months, or in a cold storage with modern equipment keeping moderate temperature, moisture, and gas level. A coating reagent is also used to lengthen storage life. Storage life varies with cultivar, ripeness, method of collection, and storage conditions. Among the cultivars of Chinese Olive, Bailan, Tanxiang is suitable for storage for it has a thick and even cuticle in pericarp, more mechanical tissue in mesocarp, cell lignified, and large resin cavity distributed thickly along pericarp. In contrast, Changying, Huiyuan etc. are not. About 90% ripeness and manual picking is needed for storage. 6-10 C is the optimum storage temperature. 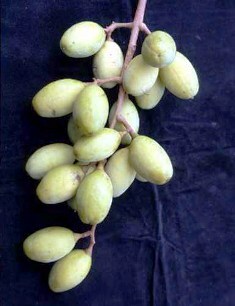 To date, Chinese Olive has been processed into types of preserved fruits, beverages, jams, wine, etc. However, preserved fruits are the most common product.